Are you passionate about working with youths? Do you want to make a difference in a youth’s life? The Sports, Tuition and Mentoring Programme (STAMP) have impacted lives of many at-risk students in participating Primary and Secondary school partners positively. Adopting a holistic approach, STAMP aims to train and improve student mentees physically, academically and equip them with sound moral values. The three components are conducted once every week separately, by sports coaches and tutors who have been engaged externally to guide students in the programme. 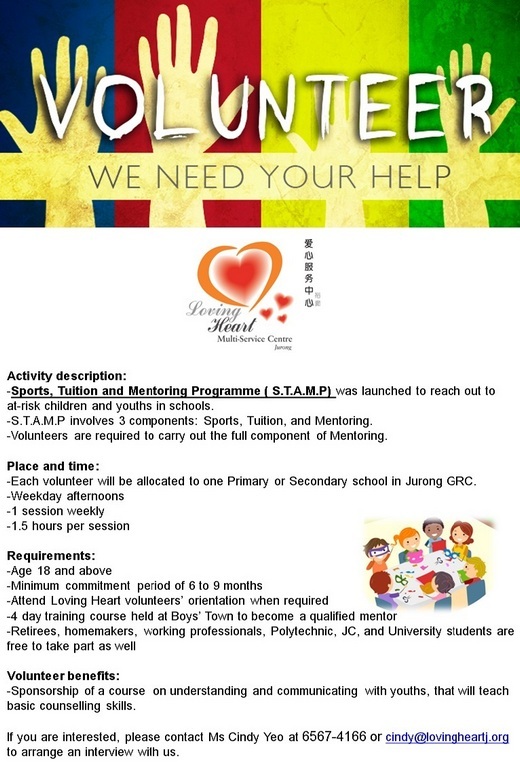 For the mentoring component, kind-hearted volunteers like you are welcome to mentor the student beneficiaries. As the backbone of the programme, the mentors play an important role in the well-being of the student beneficiaries. You will play a role as big brothers and sisters to these students, and instil positivity and confidence into them.